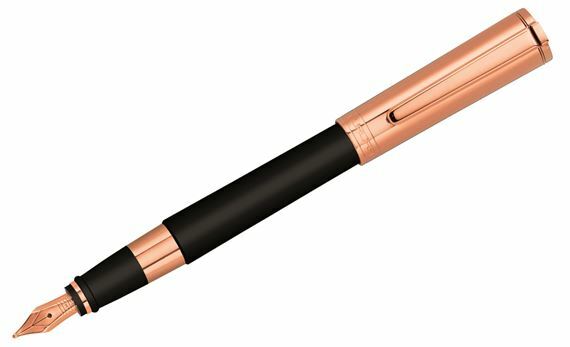 Order your Aurora Tu Black with Rose Gold Cap Fountain Pen today from FahrneysPens.com. Fine Pens, Refills & Luxurious Gifts – great prices & fast shipping. Aurora brings warmth and luxe refinement to its popular Tu series with the addition of precious rose gold - presenting the Tu Black with Rose Gold Cap Fountain Pen. The Turinese company's knack for innovative Italian design is shown by the clean form and outstanding materials that make Tu the perfect pen choice for every taste - young and old, male or female, professional or casual! The Tu rose gold fountain pen features a sleek, tapered shape with fluted cap and streamlined, spring-loaded clip. The elegant black resin body is also festooned with rose gold trim and crowned with a corresponding cap. The rich colors complement each other and create the perfect platform for the enjoyable writing that you will experience each time you use the Tu! The Tu fountain pen has a beautiful rose gold-plated steel nib available in regular or italic medium points. The Tu is also offered in a capped rollerball and ballpoint pen modes with easy, push-top mechanism. Choose from black resin with rose gold trim or black with rose gold cap - either style is terrific for engraved gifts. The Tu fountain pen accepts cartridge and converter fills - the converter can be purchased separately. Delight in a joyful writing experience on any occasion!